What's the secret to a great day of bird watching? You have to know where to look. If you are wild about birds and want to see a lot of different birds in one place, there is nothing better than a day on (or around) the water. Whether you are near Lake Michigan or down the street from a neighborhood pond, you're sure to find birds at your nearest body of water. What kind of birds could you see on a short bird watching trip? 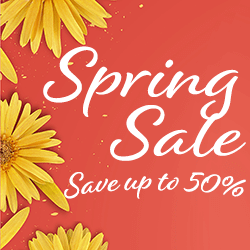 That really depends on where you live, but I'll share a day of bird watching with you. It was a day filled with unexpected surprises. I wanted to capture the beauty of the early morning (and was looking for inspiration for a new article) so I decided to head out to a nearby forest preserve and park. It was the perfect bird watching site for an early fall morning. One thing every bird watcher has learned is to look at the ground, but to also look up and around you as you walk. Sometimes birds are hiding right in front of you but you can only see them if you are paying attention. What is the most surprising place you have seen a bird? I've found that often what appears to be a simple group of trees by water is actually filled with an amazing amount of bird activity. If you want to see a lot of birds in one place, grab your binoculars and head to your nearest river, lake or large pond. My personal favorite is small lakes where birds gather in a relatively confined area so you can see a variety of birds in one visit. 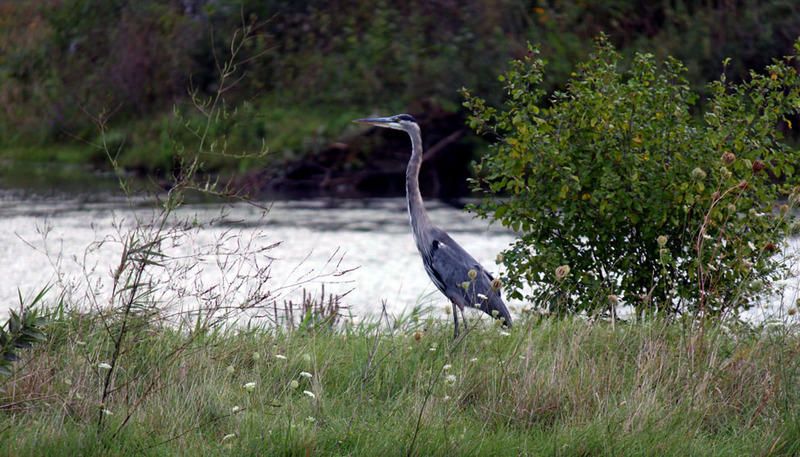 Great Blue Herons are migratory birds that are most commonly found near rivers; however, they also will go to smaller lakes where there are lots of fish. Adult birds will eat fish, large or small, when they are hungry so you may see them at one of your favorite fishing lakes or streams. I was able to spot one on the water and follow it to a second part of the lake. Great Blue Herons fly very close to the water, and I lost this one on more than one occasion as I hiked over hills to try and get another look at it. This one was willing to be photographed for a bit, but when I got too close it once again flew off. Binoculars or a good telephoto lens are the best way to get an up-close look at this large, camera-shy bird. 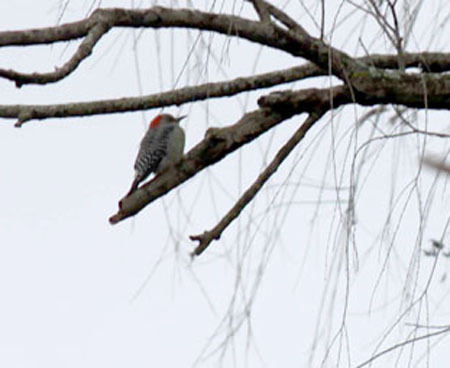 To spot one, look along river banks or on branches that are sticking up from a lake or pond. A park, lake or forest preserve is also a wonderful place to see a variety of birds and animals that co-exist peacefully (for the most part). My morning walk included the usual house sparrows feeding on the ground, but I was surprised to see that the sparrows were open to making a friend. It's fascinating to see nature in action. I watched as a small rabbit hopped into a clearing to feed with the sparrows. They seemed unaffected by the new addition to their group and fed nearby without showing interest or concern for the rabbit. Perhaps they feed together regularly. It's hard to imagine that they will be there again the next time I go, but it was a sight to see so I will definitely check during my next bird watching trip — just in case. 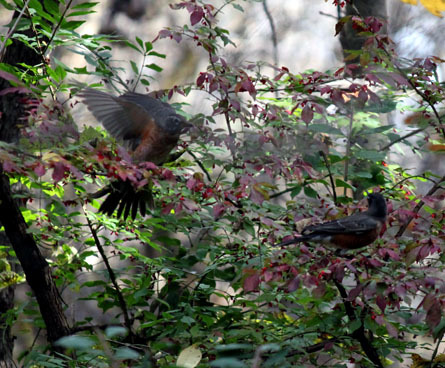 American robins are common in this area, and can often be found in groups. 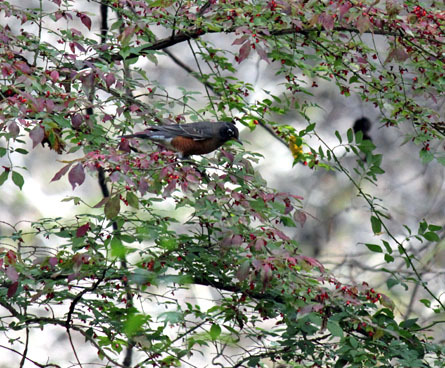 Like many other birds, they like to eat berries and so a fruit-filled bush is a great place to look for robins and other fruit-eating birds. This robin had found the perfect place to eat and had made himself at home in this bush. Other robins joined him periodically, and I was able to get a photo of one as it landed. As I moved on I saw what I thought might be a young cardinal. As I got closer, I saw that it was a Cedar Waxwing, and that his friends and family were in a nearby fruit tree. The cedar waxwing is another bird that is very sociable. These birds also travel in large groups and, if you approach slowly and cautiously, will tolerate being watched for long period of time. I watched their comings and goings for nearly a half an hour, moving closer and closer until I was able to capture close-ups of these beautiful birds. The Cedar Waxwing eats both insects and fruits. The best place to find them is in a fruit tree or near a river where they can find a plentiful supply of insects. Quietly watching these birds perch, fly and eat is a rewarding way to spend a morning. I try to keep my eyes open and my camera ready to see what the nearby trees have to show me. On this morning I was rewarded for my efforts. A downy woodpecker flew into a tree whose leaves had already fallen for the year. I was able to catch a glimpse of this small woodpecker and even snap a couple of pictures before it flew off. Woodpeckers are a rare and precious find in my forest, so I was excited by the opportunity to watch and shoot this interesting bird. A mourning dove was also resting on a branch not too far away. Although I found it unusual to see one alone at this time of year, it seemed content to rest while I took pictures. Mourning doves are not terribly afraid of people and will often nest near homes (or on top of them in gutters). They are fun to watch, and I spent a few minutes enjoying the company of this bird before moving on. 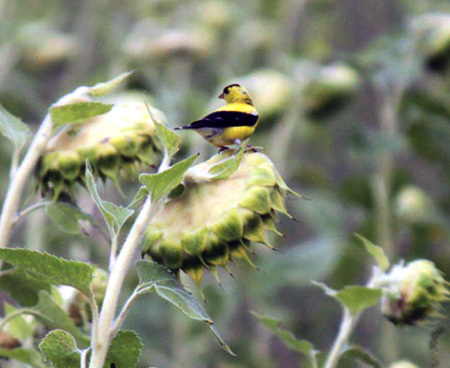 Nearby I was able to spot an adult male American Goldfinch eating dried seeds from sunflowers at the edge of the woods. 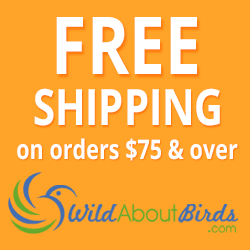 These bright-colored and easily-recognizable birds are a personal favorite, and this one was taking advantage of the kind of bird feeders only nature can provide. 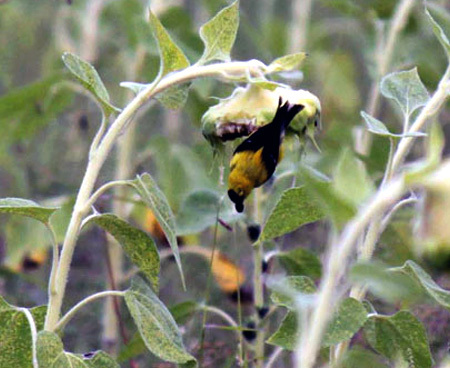 The Goldfinch flew from dried up flower to flower, often hanging almost upside down to reach the seeds. At a bird feeder in your yard, nyjer and sunflower seeds are a favorite but in the wild, American Goldfinches eat seeds from a variety of plants. 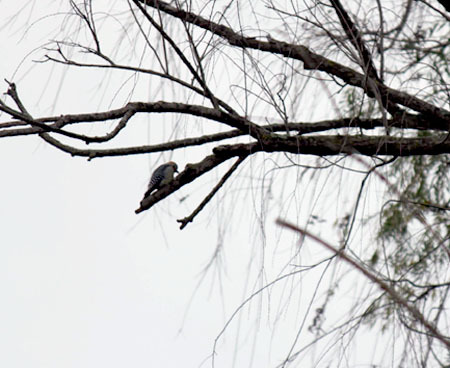 As I made my way to a more open area near the lake, I saw trees filled with different birds. The first set of trees was filled with starlings. Often considered a pest or less-than-desirable bird for your back yard because of their aggressive nature, a flock of starling is fascinating to watch in the wild. They chatter incessantly and fly between trees as a group. I was even able to see a tussle as two starlings flew at each other in what I assumed less-than-friendly behavior (since it's not mating season). Having a front-row seat to the interaction was something I'd encourage other bird watchers to try. Starlings, while not as beautiful as some other birds, have interesting interactions and this particular group seemed unfazed by my presence as an observer. 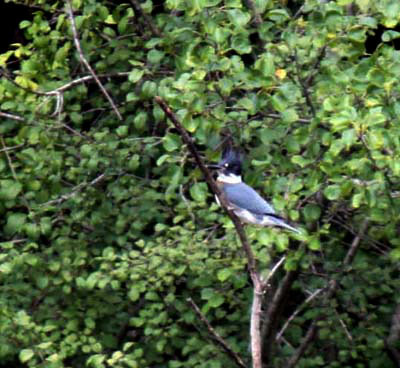 Along the edge of the park is a small pond and it was there that I was able to catch my first glimpse of a Belted Kingfisher. After I knew it was there, the flag flying in the park nearby made more sense. Apparently they nest in that particular area due to the type of material on the banks of the water. The combination of a good nesting area and abundant fish make this pond a great place to observe this unusual bird. 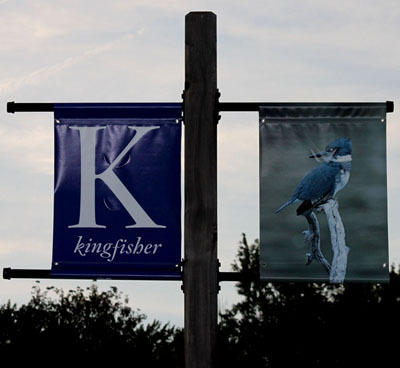 Belted Kingfishers are a bit top-heavy and have a voice that is best described as a rattle. 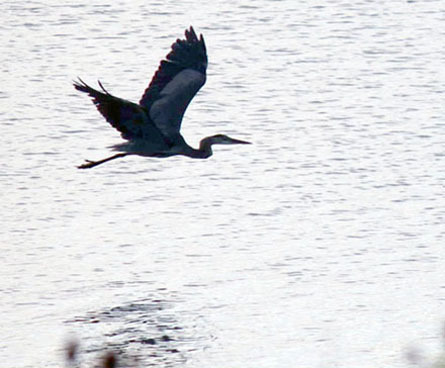 It would fly from one branch overlooking the water to another, searching the shallow water for fish. I wasn't able to get very close to the bird due to the water, but am planning another trip into the woods nearby to see if I can get a better look at these beautiful and colorful birds. A trip to the water is not complete without seeing some geese. As a child, I really enjoyed geese and seeing them now brings back memories of a childhood spent feeding ducks and geese. While I no longer encourage others to feed wildlife at a park (and yes, ducks and geese count), many children still love to see these big birds who are remarkably unafraid of people. It's important to make sure that children don't get too close as geese can be aggressive, especially while nesting. The geese will not hesitate to nip at a child and will even chase children that get too close to the nest or young gosling. Although far less exciting than a great blue heron, geese have a special place in my heart because they are an important part of the water fowl world. While their take-offs and landings are sometimes less than graceful, a gaggle of geese can quickly create the easily-recognizable "V" formation that graces many a sky in North America. 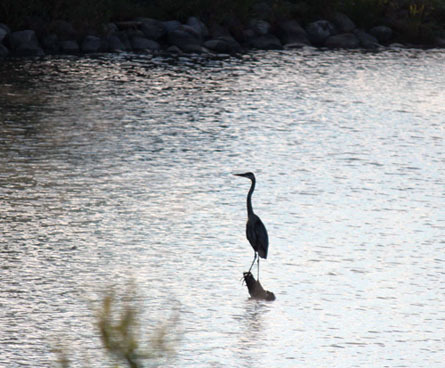 Watching and photographing water birds, and other birds as well, is something everyone should take time to enjoy. You'll find almost any medium to large-sized body of water has a great mix of wildlife and makes a great bird watching site — if you take the time to look closely. In a few hours I was able to see 10 different kinds of birds and watch them feed, fight, fly and just relax. I hope you have the chance to do the same, and share your stories with us! Photo Credit: WildAboutBirds.com photographer Judy_NMMI.